Where we do workshops in Pyongyang — Choson Exchange - Visit North Korea & Support Local Entrepreneurs! 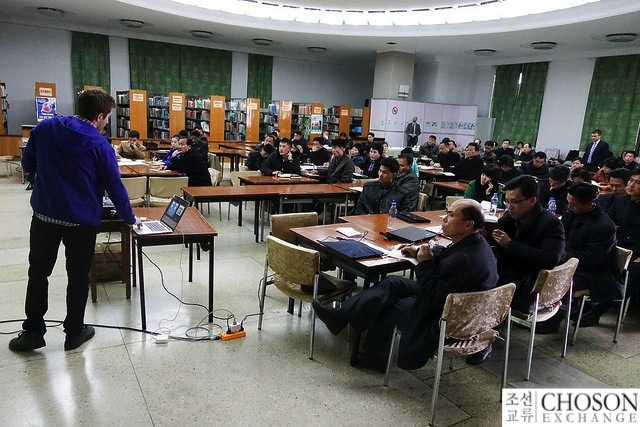 We've held workshops in multiple locations around Pyongyang, in a groovy hotel in Wonsan and in a couple different locations in Rason, in the bustling trade hub around Pyongsong, but the majority now tend to take place in the Grand People's Study House, which sits above Kim Il Sung Square, the political heart of the country. The Grand People's Study House is described in a DPRK book - Korea in the 20th Century - as having "a total floor space of 100,000 square meters. Occupying 22,744 square metres of ground and composed 638 rooms, big and small, this great temple of learning is capable of received about 10,000 to 12,000 people a day." We've never seen that many, but it is usually busy when we conduct workshops there. Even in the winter, when it can be quite chilly, hundreds of people come to the Grand People's Study House to, well, study. To return to Korea in the 20th Century: "It is not merely a library. It caters to the different needs of its visitors, ranging from lectures and study workshops to question and answer sessions and rooms for listening to music, using various forms and methods." There are often language classes going on (we've jumped in and taught a couple) and experts are available to answer questions that students might have. We heard that when Christopher Hitchens visited, he got into a debate with one such expert, when he was described as "the world's foremost expert on Marxism." His poor translator had to suffer through a long, technical argument on Trotskyism and dialectic materialism. The room we conduct workshops on has also fostered debate. We've seen our participants really go at it over marketing and growth strategies, debating to a point where it got a little uncomfortable for the rest of us. We've also seen real cooperation and solidarity as participants try to figure out challenges our volunteer workshop leaders have assigned them. The room is large, easily accommodating one hundred people or more, and let's us move people around to create small, active groups. The views from the top floor are amazing.